Britwell House in Britwell Salome, Oxfordshire was the Hicks’ main family home, and a place to experiment for designer David Hicks. 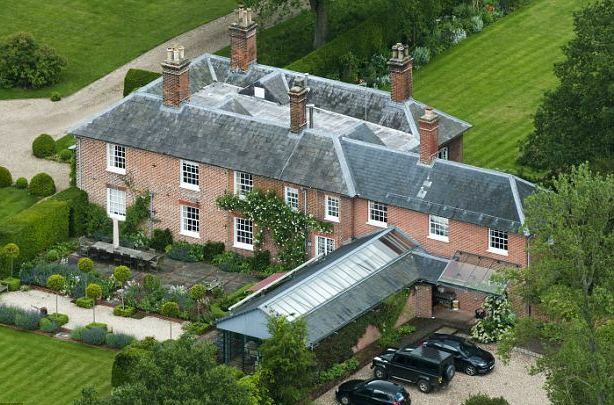 Built around 1728, David and Pamela Hicks bought the Georgian property (with 20th century additions) shortly after their wedding in 1960. Read more about the structure via this British Listed Buildings record. The house and its contents were sold in 1979 when his business declined and taxes and maintenance became too costly. After the auction of Britwell House, the Hicks family moved to The Grove, a smaller house on the estate, in the valley below Britwell. They also lived in a set of rooms at the Albany, the early-19th-century apartment building in Piccadilly, London which has housed many famous names over the years including Lord Byron, Aldous Huxley, Harold Nicolson, J.B. Priestley and William Henry Fox Talbot. David Hicks spent the last 18 years of his life working on the house and garden at The Grove, which remains the Hicks family home today. He died of lung cancer in 1998 (read an obituary here), but went out in style: He designed his own coffin, in which he ‘lay in state’, according to his precise instructions, in the ground-floor room of the Gothick pavilion, also of his own design. Inspired by the Anglo-French gardens of the early 18th century, he created avenues and vistas of various sizes, forming an intricate sequence of green ‘rooms’, using a combination of rigid formality and lush romanticism. See it via Google maps here. Lady Pamela Hicks continues to live at The Grove, and whilst not open to the public, small private groups are occasionally allowed to visit. More information here. The family also have a house called Savannah on the tiny adjoining island of Windermere (next to Eleuthera), in the Bahamas. Read India Hicks’ own account of the rebuilding work which was done following a hurricane there. The property is now available for rent to private parties via India and David Flint Wood’s website. And you can take a look at India’s own Bahamas home and other guest properties via this Luscious blog post. The following photos are apparently from The Grove, but I suspect there might be some from Britwell House mixed in there too. This entry was posted in Uncategorized and tagged allegra hicks, ashley hicks, david hicks, english country houses, india hicks, pamela hicks.